Hollybeary Creations : NND February Release!! Happy Tuesday everyone.. It's time for a Peek at the February Release from Newton's Nook. Join us all week long as we reveal the new stamps and dies. All the new products will be available in the store on Friday February 17th! 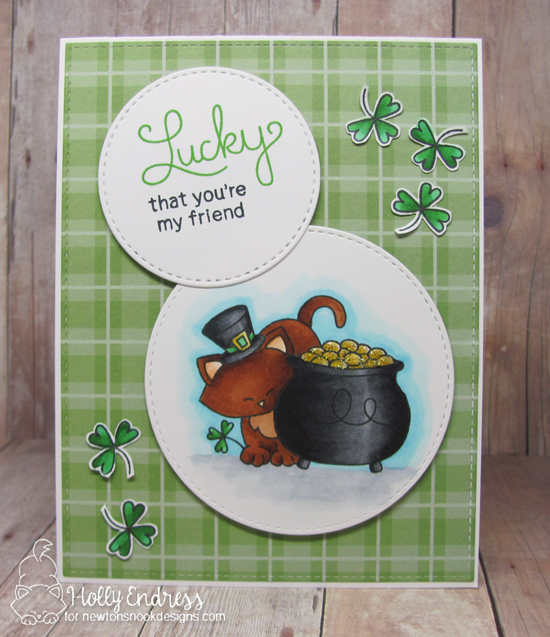 Today the team is showcasing the Newton's Pot of Gold set and a fun new Die set called Land Borders. 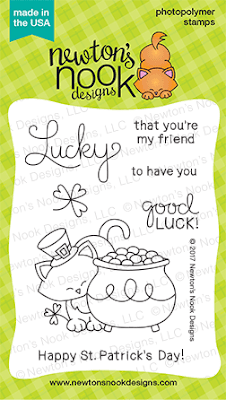 I love this new Land Borders die set and How cute is the Newton? I started by die cutting a panel of pattern paper with a Stitched Rectangle die set. Then I adhered the panel to a White top folding card base. I die cut two stitched circles and stamped the sentiment and image in each. I colored the images in with Copic Markers. I fussy cut the shamrocks out and added them in the background. I adhered each circle with some foam tape and then I added some Nuvo Drops in Gold Glitter to the gold coins and let them dry. So cute!!! Nice card! Love your design! This is adorable Holly and your colouring is amazing! Great card! 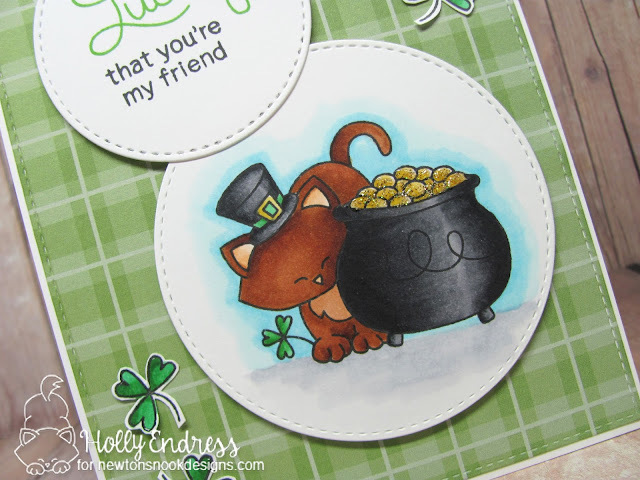 I love the sentiments in this set, and you colored the stamped images beautifully! So cute, your card! Really beautiful! I'm loving your card, really nice coloring! OMG Holly this is CUTE! Cute. I like your coloring and the plaid paper. Love this adorable Newton design with the pot of gold! Awesome coloring on your sweet card! This is so stinkin' cute! Your coloring is awesome, and the patterned paper you picked is just perfect! Beautiful card! What a great card Holly. I love the patterned paper in the background. Cute card, love the green plaid paper. Fantastic! Love your awesome coloring and glittery shiny finish touches!!! Love the seeet card and the patterned paper you used! So cute! I love the way you added in all the extra shamrocks!